The Grammys has made the headlines for a lot of reasons, but some artists stopped the show with their outfits alone! Check them out. Cardi B channelled her inner mermaid with this amazing red carpet look. She had a lot to celebrate after she became the first ever solo woman to win the Best Rap Album award. You go, Cardi! Kylie Jenner's outfit had a lot of people talking! Whether you love it or hate it, at least the pink jumpsuit's matching gloves would have helped her stay warm on the red carpet. Bebe Rexha has managed to match the red carpet perfectly with this huge gown. She was nominated for Best New Artist, but lost out to Dua Lipa. 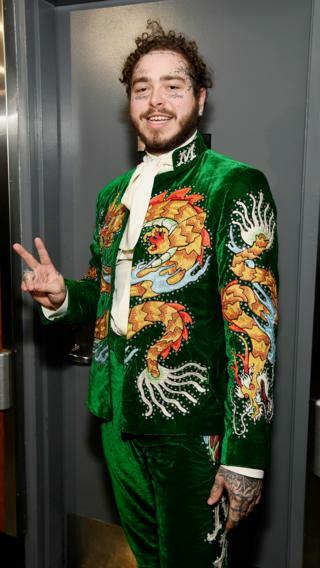 Post Malone was nominated for four different awards at the Grammys, and although he didn't win any, he definitely caught attention with his green dragon suit. Katy Perry went for a very bold pink dress, although she changed out of it when she performed onstage with Dolly Parton. It doesn't look like the easiest outfit to dance in! Jennifer Lopez and her partner Alex Rodriguez clearly didn't want to upstage each other and went for equally striking outfits. Check out that giant hat! JLo performed a tribute to Motown after the record company turned 60 this year. And finally... the dress that didn't make the Grammys! Ariana Grande showed off the dress she got to go to the awards - before falling out with the organisers and deciding not to turn up. She won her first Grammy award for her album Sweetener. Guide: What are the Grammys?